A complex set of Low Pressure systems over the eastern half of the United States brought multiple cloud layers and IFR conditions to the northeastern United States on 20 February. 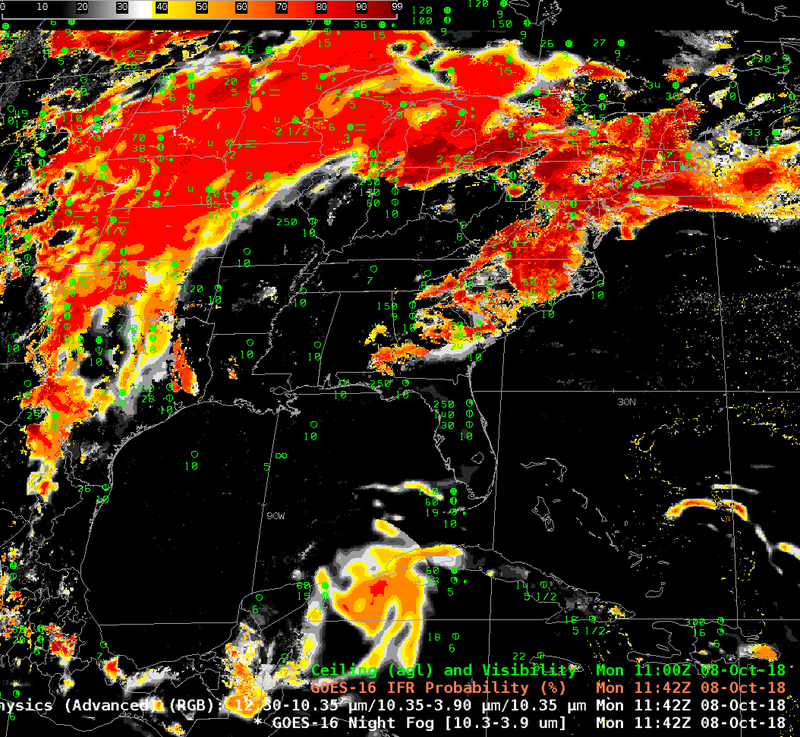 The image above shows the IFR Probability field at 1007 UTC. IFR Conditions are apparent from the Chesapeake Bay northeastward through southeastern Pennsylvania and New York and coastal New England, as well as over southeastern Ontario Province in Canada and the Canadian Maritimes. These are also regions where IFR Probabilities are high, generally exceeding 80%. In regions where IFR conditions are not observed (Western Pennsylvania and Ohio, for example), IFR Probabilities are generally small. 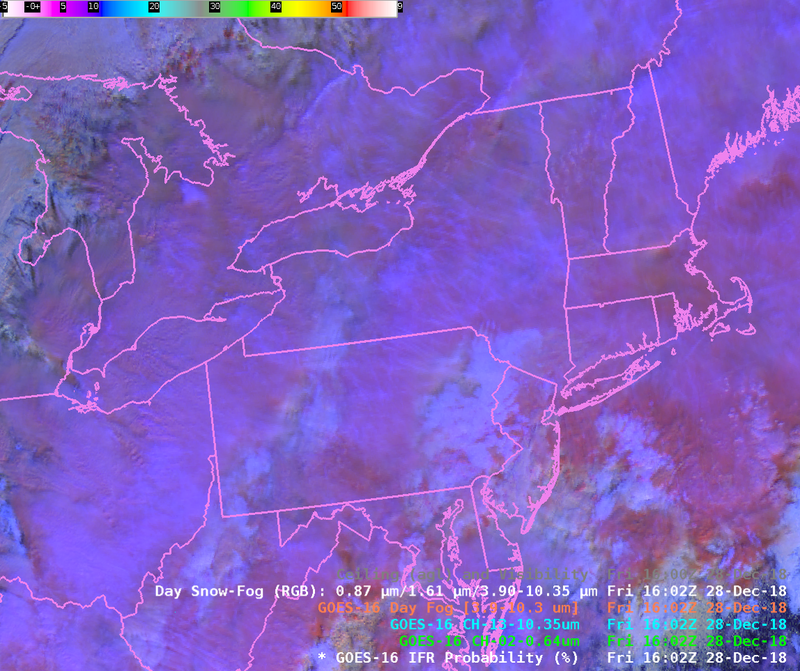 When multiple cloud decks are present, as occurred on 20 February, satellite-only detection of low clouds is a challenge, as shown with by the brightness temperature difference field (10.3 µm – 3.9 µm), called the ‘Night Fog’ difference in AWIPS, below. High and mid-level clouds (grey/black in the enhancement used) make satellite detection of low-level stratus impossible. So, for example, stations with IFR conditions over Long Island sit under a much different enhancement in the brightness temperature difference field compared to stations with IFR conditions over southern New Jersey and southeastern Pennsylvania. Because the Brightness Temperature Field cannot view the low clouds, the Nighttime Microphysics RGB (shown below the Brightness Temperature Difference field) similarly cannot identify all regions of low, warm clouds — typically yellow or cyan in that RGB. This entry was posted in GOES-16, Mid-Atlantic, New England on February 20, 2018 by Scott Lindstrom. The images above show the GOES-16 Brightness Temperature Difference at the same time at two places over the United States: The mid-Atlantic States (above) and Oregon and surrounding States (below). The ‘Fog’ Product, as this Brightness Temperature Difference is commonly called, in reality identifies only clouds that are made up of water droplets — that is, stratus. A cloud made up of water droplets emits 10.3 µm radiation nearly as a blackbody does. Thus, the computation of Brightness Temperature — which computation assumes a blackbody emission — results is a temperature close to that which might be observed. In contrast, those water droplets do not emit 3.9 µm radiation as a blackbody would. Thus, the amount of radiation detected by the satellite is smaller than would be detected if blackbody emissions were occurring, and the computation of blackbody temperature therefore yields a colder temperature, and the brightness temperature difference field, above, will show clouds made up of water droplets as positive, or cyan in the enhancement above. 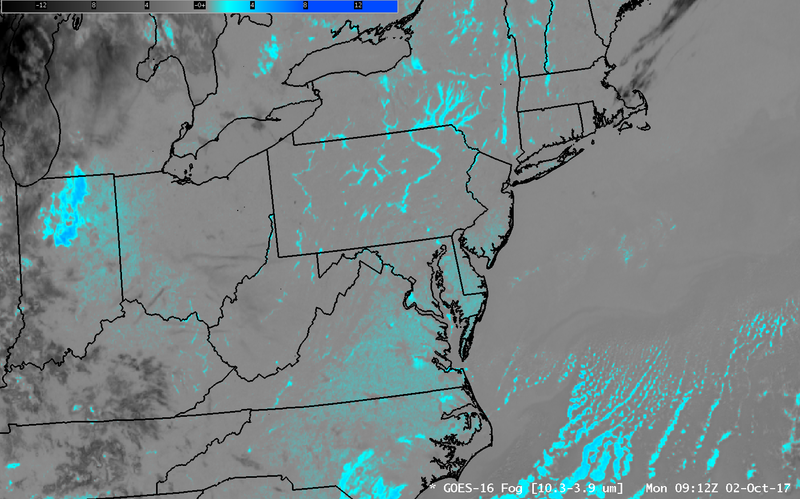 The River Valleys of the northeast show a very strong signal that suggests Radiation Fog is developing over the relatively warm waters in the Valleys. The Delaware, Hudson, Mohawk, Connecticut, Susquehanna, Allegheny, Monongahela, and others — all show a signature that one would associate with fog. A signal is also apparent from southern New Jersey southwestward through the Piedmont of North Carolina. Would you expect there to be fog there as well, given the signal? 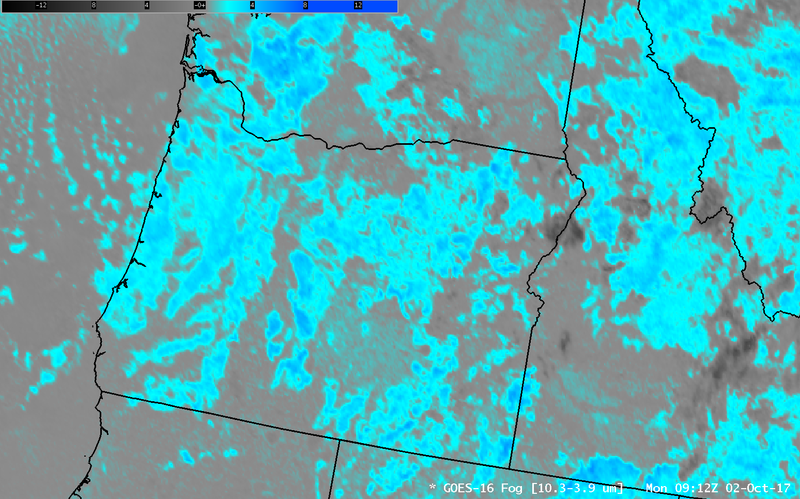 The State of Oregon at the same time shows a very strong signal in the ‘Fog’ Product. A clue that this might be only stratus, and not visibility-restricting fog, lies in the structure of the clouds — they do not seem to be constrained by topographic features as is common with fog. GOES-R IFR Probabilities are computed using Legacy GOES (GOES-13 and GOES-15) and Rapid Refresh model information; Preliminary IFR Probability fields computed with GOES-16 data are available here. These GOES-16 fields should be available via LDM Request when GOES-16 becomes operational as GOES-East. GOES-R IFR Probability Fields use both the Brightness Temperature Difference field (10.7 µm – 3.9 µm) from heritage GOES instruments and information about low-level saturation from Rapid Refresh Model output. The horizontal resolution on GOES-13 and GOES-15 is coarser than on GOES-16 (4 kilometers at the sub-satellite point vs. 2 kilometers), so small river valleys will not be resolved. (It is also difficult for the Rapid Refresh model to resolve small valleys). The IFR Probability Fields, above, show some signal over the river valleys of the northeast; that signal is mostly satellite-based, but the poor resolution of GOES-13 means that fog/stratus in the river valleys is not well-resolved. Still, a seasoned forecaster could likely interpret the small signals that are developing to mean fog is in the Valleys. (And restrictions to ceilings and visibilities are certainly reported in the river valleys of the Mid-Atlantic and Northeast) IFR Probabilities are also noticeable over southeast Virginia, although widespread surface observations showing IFR Conditions are not present. (Such observations are somewhat more common near sunrise, at 1130 UTC). IFR Probabilities are much less widespread over Oregon, with most of the signal over western Oregon related to the topography. 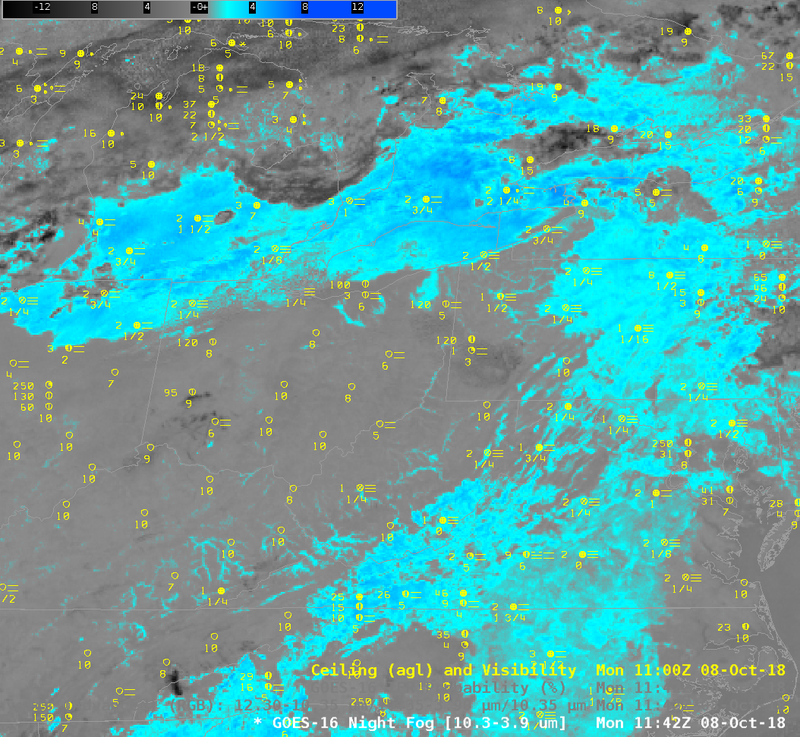 In this example, IFR Probabilities are ably screening out regions where elevated stratus is creating a strong signal for the satellite in the Brightness Temperature Difference field. This entry was posted in GOES-16, Mid-Atlantic, Pacific Northwest on October 2, 2017 by Scott Lindstrom. Low ceilings and reduced visibilities developed in and around thunderstorms from Ohio and Michigan into southwestern Ontario, upstate New York and northern Pennsylvania during the morning of 11 July 2017. 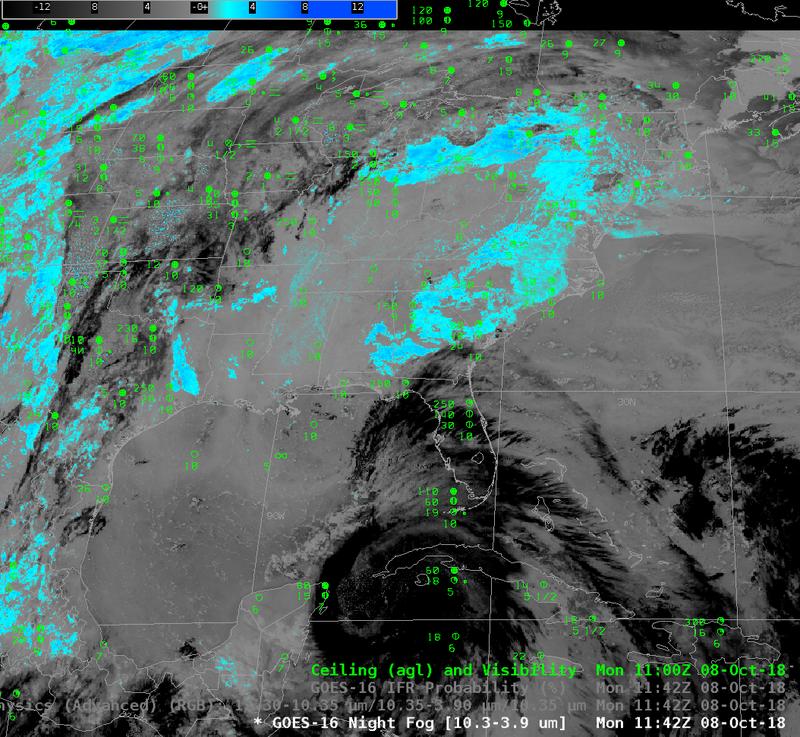 (Reduced visibilities/lowered ceilings persisted past 15 UTC as shown in this image from here). Regions of IFR conditions over northwestern Pennsylvania are in regions of higher IFR Probability after 0500 UTC (over northwest Pennsylvania) and after 0700 UTC (over much of northern Pennsylvania) that have the characteristic flat field look that comes from having only Rapid Refresh Model output drive the Probability (because high clouds, as might occur downwind of Convection, prevent the satellite from seeing low clouds). GOES-R IFR Probability fields also retain a signal through sunrise, as shown in the this toggle between 1000 UTC and 1100 UTC, two times on either side of the terminator. Because high clouds inhibit the view of low stratus (and potential fog), products that rely on solely satellite data become ineffectual as a situational awareness tool. 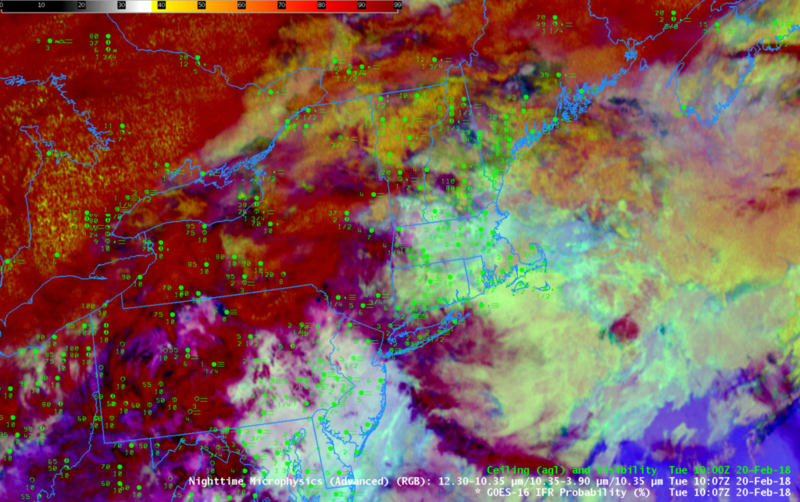 Consider the toggle below from 0800 UTC of GOES-R IFR Probabilities, the GOES-16 “Fog Product” Brightness Temperature Difference (10.3 µm – 3.9 µm) and the Advanced Nightime Microphysics RGB (that uses the Brightness Temperature Difference Product as one of its components). IFR Conditions over NW Pennsylvania are not diagnosed by the GOES-16 products that rely on the 10.3 µm – 3.9 µm Brightness Temperature Difference field. Where there is a clear field of view, all three products can highlight IFR conditions (in/around London Ontario, for example). 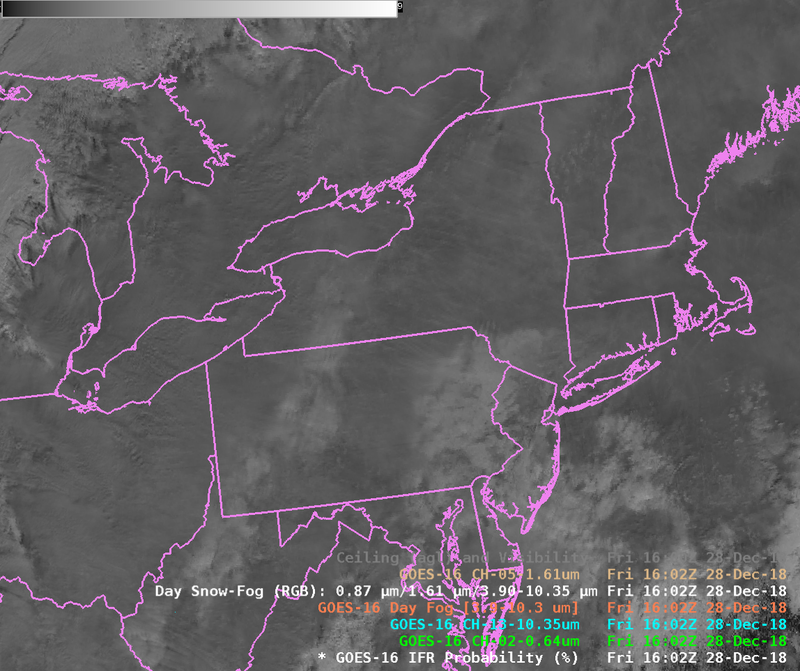 Regions of low stratus — but not fog — are also highlighted over parts of upstate New York by the GOES-16 products. 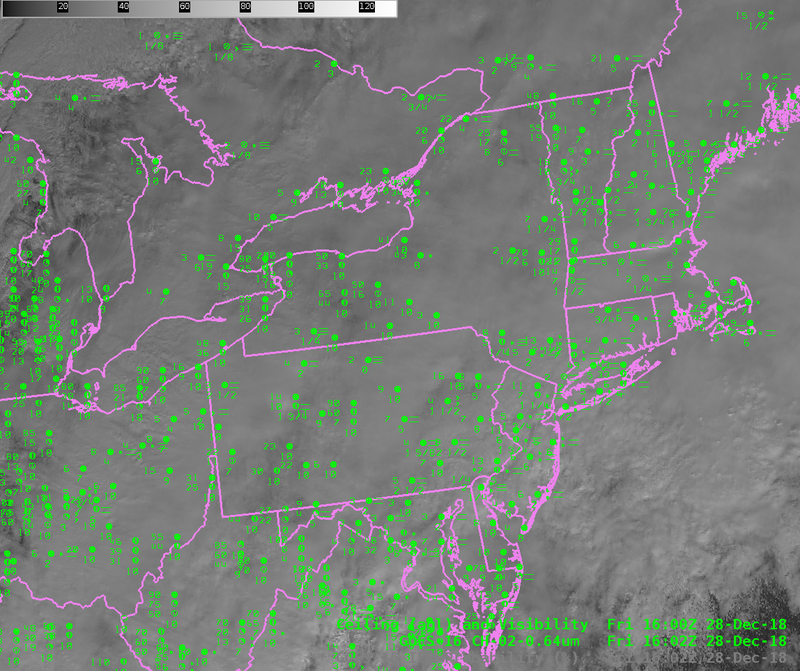 (Similar toggles at 0915 and 1100 UTC are available; note that the signal from GOES-16 becomes weak at 1102 UTC because increasing amounts of solar reflectance change the sign of the 10.3 µm – 3.9 µm Brightness Temperature Difference. These examples typify why GOES-R IFR Probability fields typically have better statistics as far as IFR detection is concerned: Model data fills in regions where high clouds are present, and model data screens out regions where stratus is highlighted by a Brightness Temperature Difference field, but where fog does not exist. This entry was posted in Mid-Atlantic, Multiple Cloud Layers on July 11, 2017 by Scott Lindstrom. Note: GOES-R IFR Probabilities are computed using Legacy GOES (GOES-13 and GOES-15) and Rapid Refresh model information; GOES-16 data will be incorporated into the IFR Probability algorithm in late 2017. 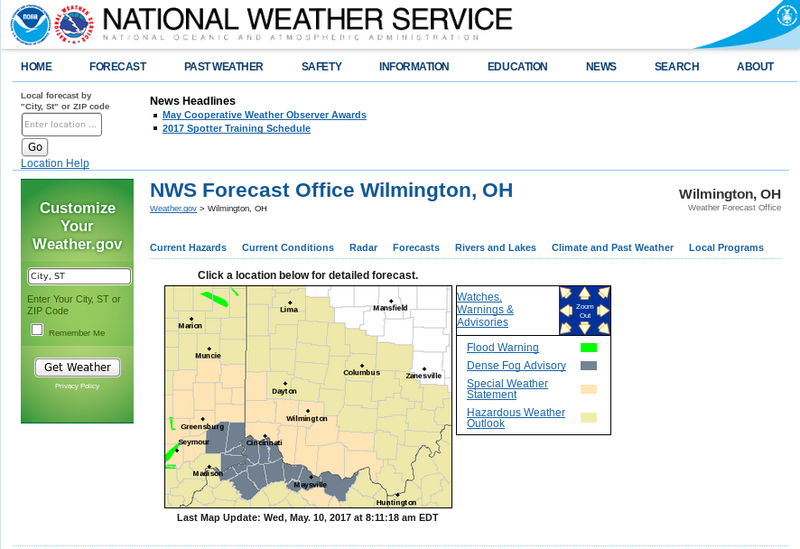 The weather.gov website on Wednesday morning 10 May 2017 showed two dense fog advisories, one near Cincinnati, OH and one near Greensboro, NC. 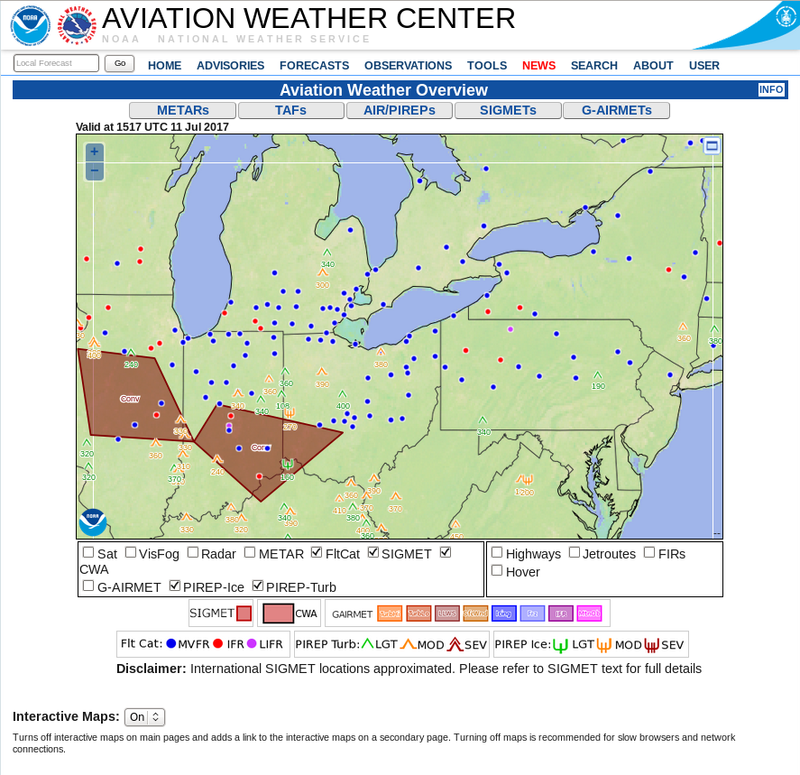 The aviation weather website showed an IFR Sigmet in between the two regions of dense fog. The fog formed along a stationary front that sat over the region. 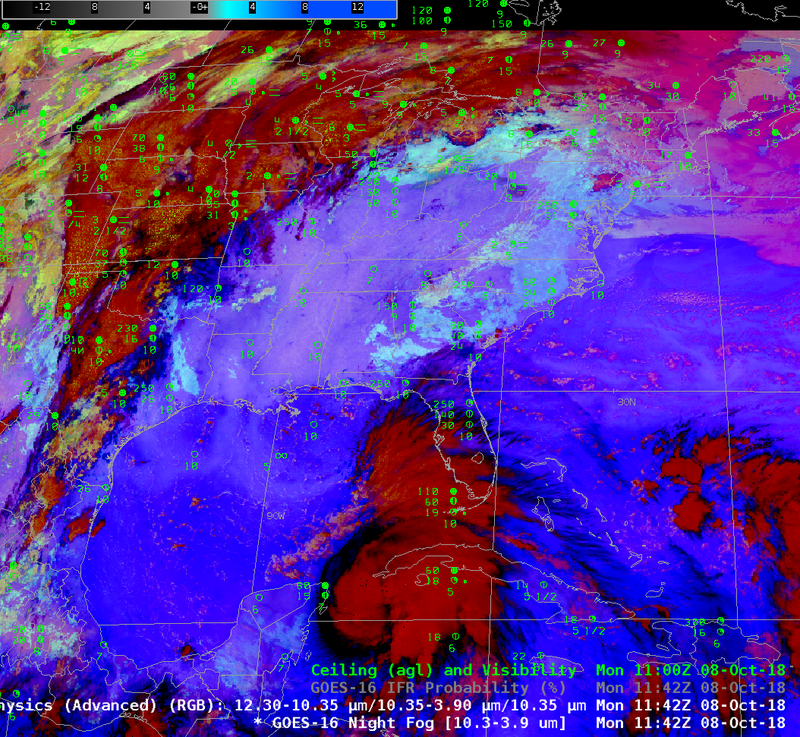 How well did GOES-R IFR Probabilities and GOES-13 Brightness Temperature Difference fields capture this event? The animation of GOES-R IFR Probability, below, computed using data from GOES-13 and the Rapid Refresh Model, shows enhanced probabilities early in the evening that increased with time. The orientation of the field — from west-northwest to east-southeast — aligns well with the regions of developing fog. The brightness temperature difference field, below, did not perform as well in outlining the region of low ceilings/reduced visibilities because of the presence of high clouds that interfered with the ability to detect low clouds. Consequently, the highest brightness temperature differences (3.9 µm – 10.7 µm) do not align so well with the regions of developing fog. Note also that at the end of the animation — 1100 UTC — increasing amounts of reflected solar 3.9 µm radiation is changing the character of the field from negative to positive. In contrast, the IFR Probability fields (above) maintain a consistent signal through sunrise. This entry was posted in Mid-Atlantic, Midwest on May 10, 2017 by Scott Lindstrom. 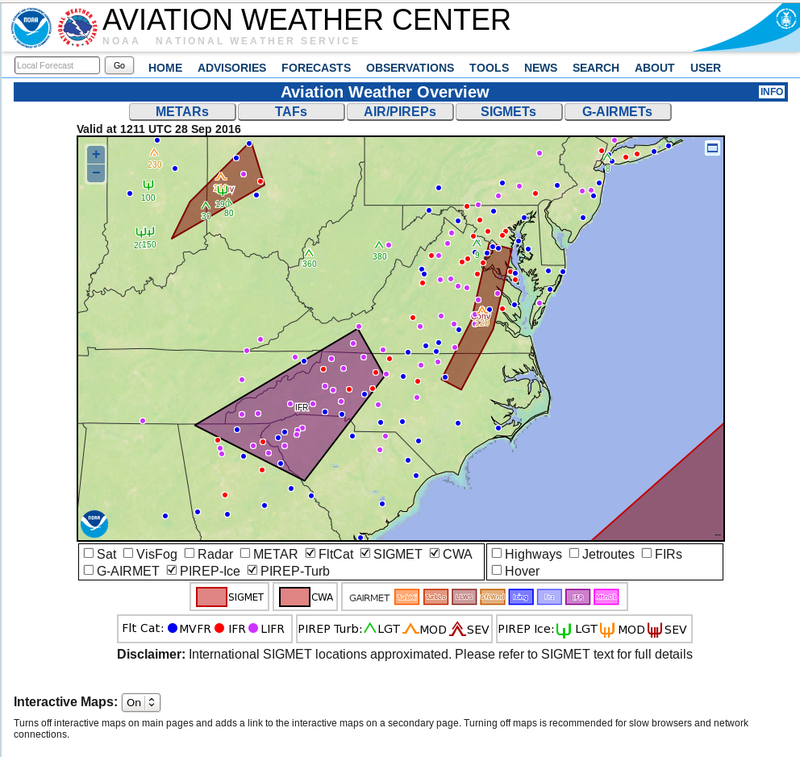 IFR and Low IFR Conditions developed over parts of Virginia and the Carolinas Piedmont Region during the morning of 28 September 2016. The screengrab below, from the Aviation Weather Center, shows the areal extent of the reduced visibilities and/or low ceilings. (The text of the IFR Sigmet is here.) 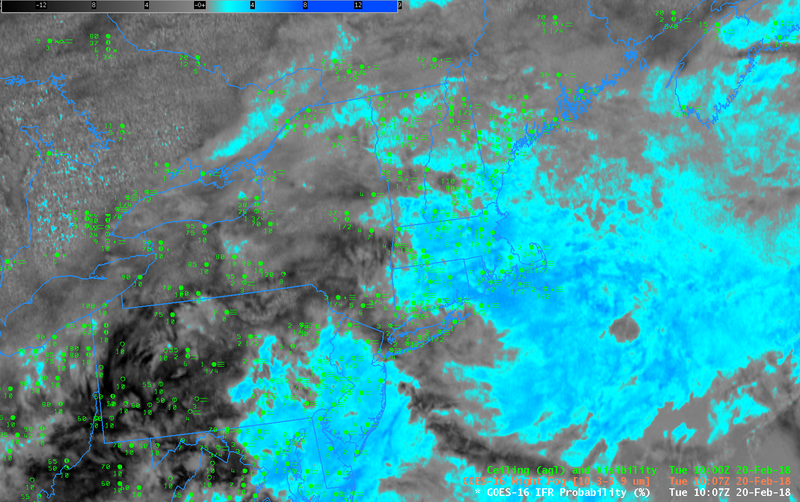 Fog over southeastern Virginia is developing under multiple cloud decks associated with the convection near a front. IFR Probabiities in this region are determined by Rapid Refresh data that shows low-level saturation; the flat-looking field over that region is characteristic of model-only IFR Probability fields. 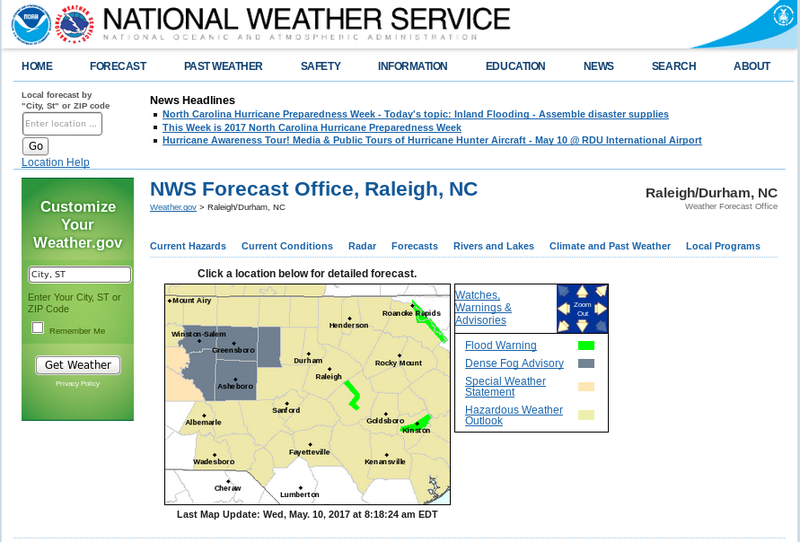 Farther to the southwest, over western North Carolina, IFR Probabilities are determined by both satellite and model data; notice how pixelated the data are in that region. Suomi NPP overflew the eastern United States shortly after 0730 UTC, and the toggle below shows the Day Night Visible Band and the Brightness Temperature Difference field (11.45 – 3.74 ). Water-based clouds (yellow and orange in the enhancement used) are detected just to the west of cirrus and mixed-phase clouds (black in the enhancement used). The 0737 UTC IFR Probability field, at bottom, had model-data only as predictors in regions where Suomi NPP shows multiple cloud layers. Note also that the 1-km resolution of Suomi NPP is resolving the developing valley fogs in the Appalachian mountains of Ohio, West Virginia and Kentucky. There are only a few pixels in the IFR Probability field that are suggesting valley fog development — but note in the end of the animation at the top of this post that more valley pixels show IFR Probability signals. When GOES-R is flying, its superior (to GOES-13) 2-km resolution should mitigate this too-slow identification of valley fogs. This entry was posted in Mid-Atlantic, Southeast, Suomi/NPP on September 28, 2016 by Scott Lindstrom. GOES-R IFR Probabilities captured the development of coastal fog over coast of the Atlantic Ocean from Long Island south to North Carolina on the morning of March 17 2016 behind a weak cold front. 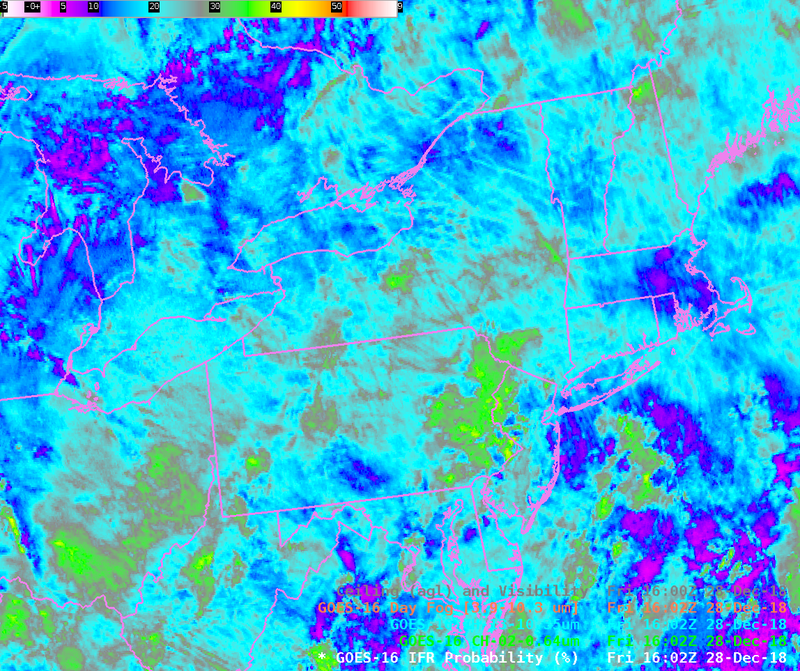 IFR Conditions penetrated into the Delaware and Lehigh River Valleys over Pennsylvania. In general, GOES-R IFR Probability fields captured the region of IFR conditions as it developed and expanded. Note that the IFR Probabilities remained elevated through 1400 UTC along the eastern shore of Chesapeake Bay. 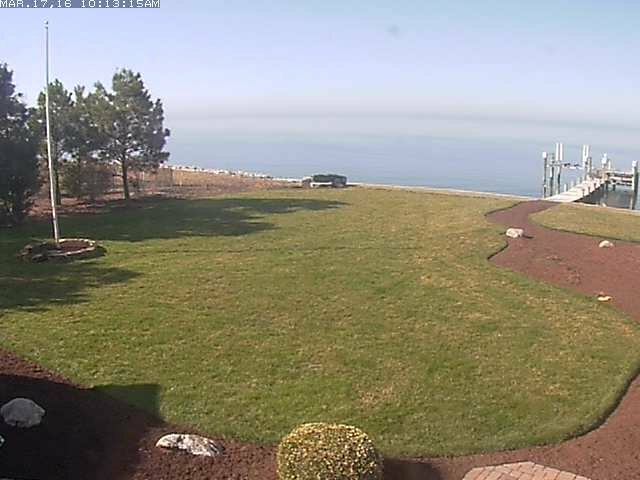 The 1413 UTC webcam image from Tilghman Island, below, (source), shows an offshore fogbank. This entry was posted in Mid-Atlantic on March 17, 2016 by Scott Lindstrom. 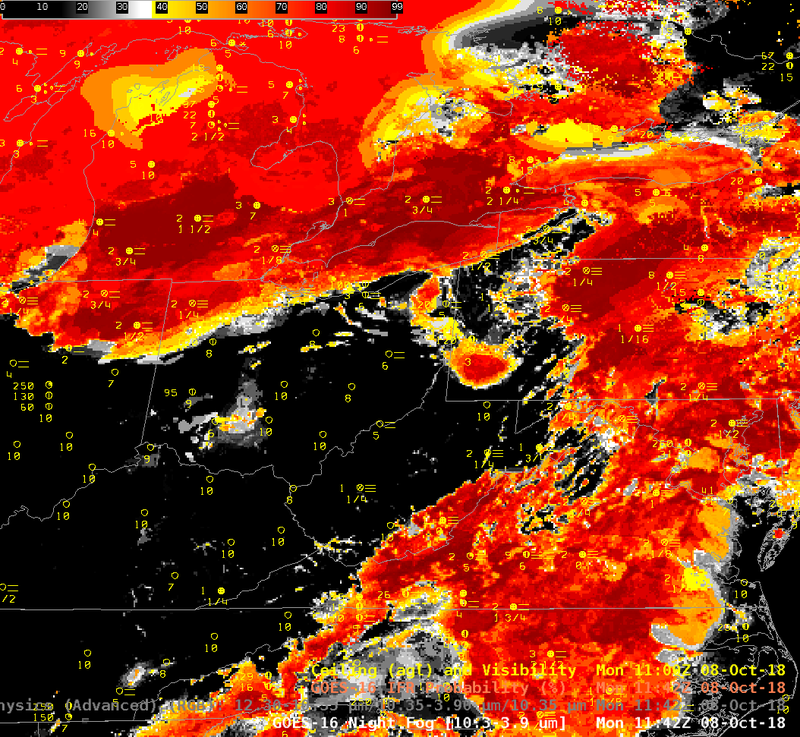 IFR Conditions frequently occur with storms along the East Coast. Satellite detection of such conditions is very difficult because of the multiple cloud layers that accompany cyclogenesis. The IFR Probabilities, above, have a character that reflects their determination solely from Rapid Refresh Data. That is, Satellite Predictors were not considered over much of New England because of the presence of multiple cloud layers, as suggested in the Water Vapor animation below. IFR Probability fields are initially entirely offshore in the animation above, and IFR conditions are not observed over southern New England. Note how IFR probabilities initially increase over land over southern New Jersey and then quickly move northeastward into southern New England as IFR Conditions develop. Because satellite predictors are unavailable in these regions (on account of the many clouds layers), the simultaneous development of high IFR Probabilities with observed IFR Conditions argues for a good simulation of the observed weather by the Rapid Refresh. Fused data products such as IFR Probability fields join the strengths of different systems to provide a statistically more robust field than is possible from the individual pieces. When daytime arrives — at around 1215 UTC in the animation above — a distinct transition is apparent in the GOES-R IFR Probability fields. This occurs because Satellite Data — visible satellite data — can be used during daytime to articulate the regions of cloudiness with more precision. Because cloudiness in general is better defined, IFR Probability fields (that require the presence of clouds) increase somewhat, and the color table used emphasizes that change. This entry was posted in Mid-Atlantic, Multiple Cloud Layers, New England on February 5, 2016 by Scott Lindstrom. 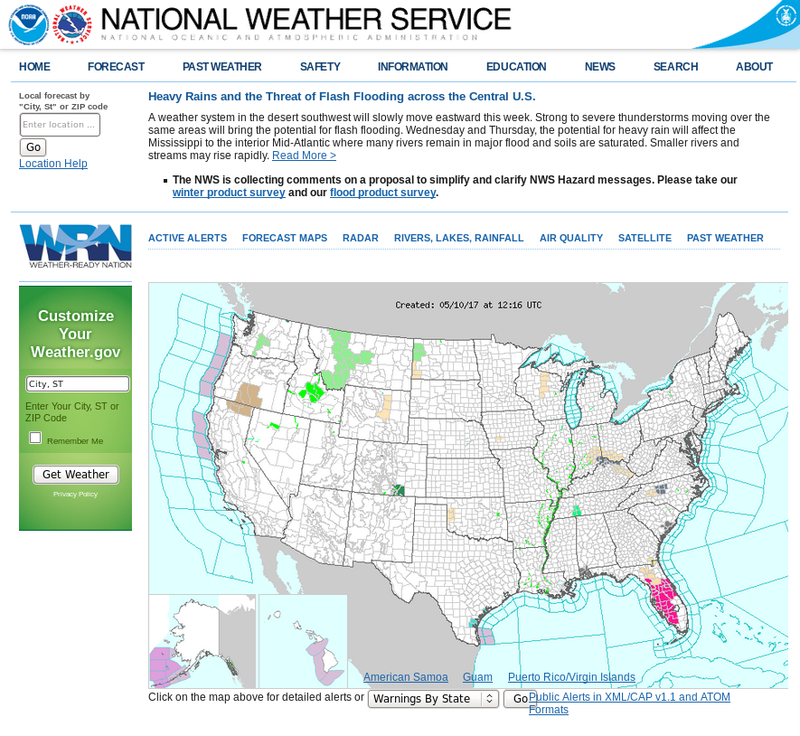 Dense fog developed over South and North Carolina on the morning of 22 October 2015, just inland from the coast (Click here for screenshot from the National Weather Service homepage from Wilmington NC). The animation, above, shows the hourly evolution of the GOES-R IFR Probability fields from just after sunset on the 21st through sunrise on the 22nd. Highest probabilities of IFR Conditions overlap the stations where IFR Conditions occur. GOES-R Cloud Thickness also gives information on where the thickest clouds are; the 1115 UTC Cloud Thickness (the final field before twilight conditions change the 3.9 µm emissivity used to diagnose Cloud Thickness) shows the thickest clouds removed from the coast; compare that region to the regions with fog remaining at 1315 UTC in the animation above. There is good overlap. The maximum cloud thickness in the just-before-sunrise image below is a bit over 1000 feet, in northeastern North Carolina; according to this scatterplot that relates pre-sunrise cloud thickness to dissipation time, fog dissipation should occur within 3 hours, that is by 1415 UTC. IFR Probabilities have better statistics in outlining regions of dense fog. This is because fog that reduces visibility and low stratus that does not reduce visibility can look very similar to a satellite. IFR Probability fields incorporate near-surface information in the guise of Rapid Refresh model predictions of low-level saturation that better refine regions where low stratus extends down to the ground. There are regions where brightness temperature difference has a fog-like signal with high ceilings/good visibility (central South Carolina, for example). These regions have low IFR Probability values because the Rapid Refresh model does not predict low-level saturation. Fusing satellite and model data yields a better product. The visible animation, below, shows that fog dissipated completely shortly after 1430 UTC, in accordance with expectations based on the Cloud Thickness. This entry was posted in Dissipation Time, Mid-Atlantic on October 22, 2015 by Scott Lindstrom.